I can now share the finished craft room. As usual, with ANY craft room, this will likely continue to be a work in progress. As I ponder a new or different way to store some things - I will continue to do that. But for the most part, it is finished. Before any work could begin, I first had to plan. For me -- it is best if I can make a plan on paper and so I did! I printed out some free graph paper at 1/2 inch to one foot scale. I measured everything that "had to be in my stamp room. I cut out pieces to represent each thing and put removable adhesive on the back. Then I could make some adjustments as I planned and as the work progressed. This is just as you enter my stamp room. Then have a look at the counter space. My son-in-law built me three narrow shelves and attached them to the wall just above the counter top. 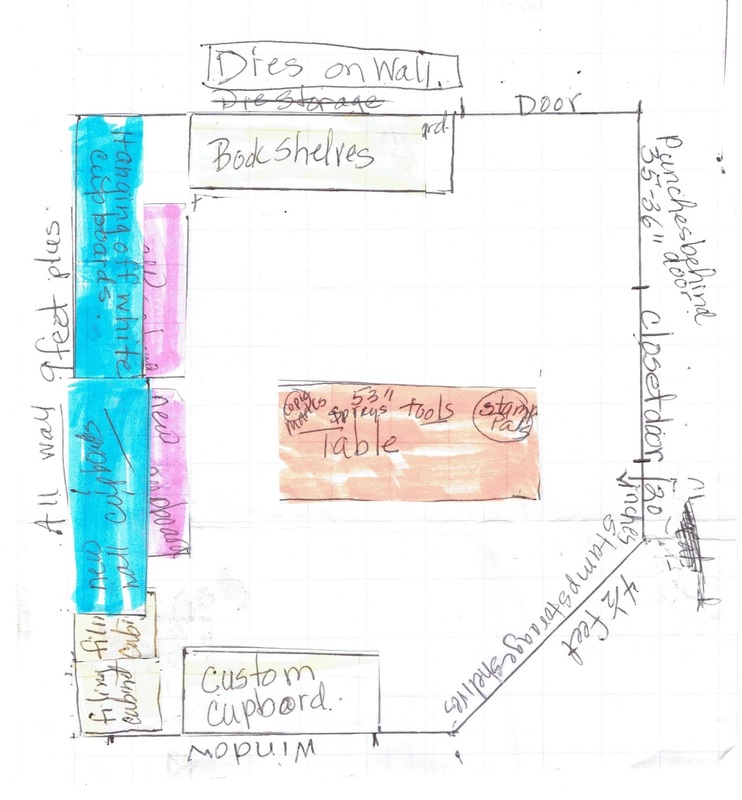 The shelves are 2 1/2 inches wide -- and then custom spaced to fit the height of the jars or bottles. The shelves run the entire length of the counter top. As you come into my room, punch storage is just the behind the door! 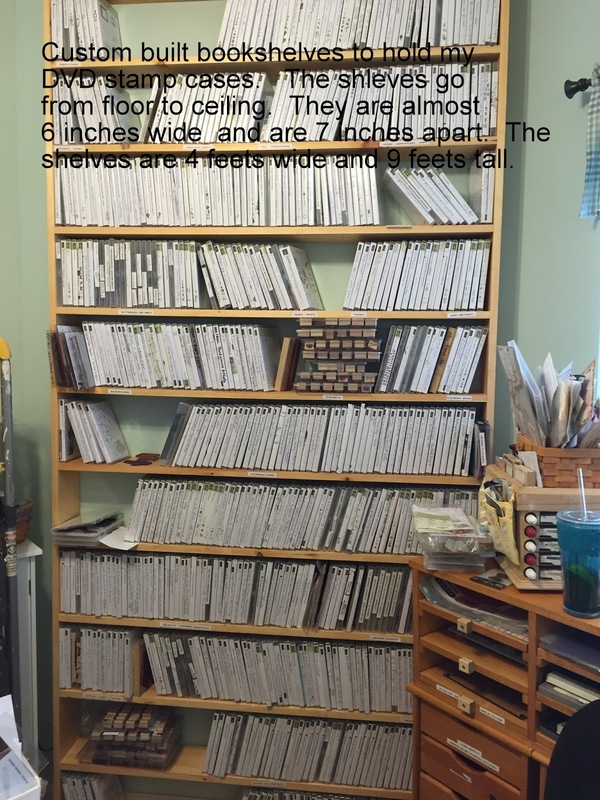 All stampers and scrapbookers use a lot of ribbon. But the question is where do you store it? And how to store it so you can get at it easily? My solution is PVC gutters attached to the wall! On my desk top -- and in the desk drawer -- are the things I use quite frequently. To the right of my chair is a 2 drawer filing cabinet with scraps of paper all filed according to colors. 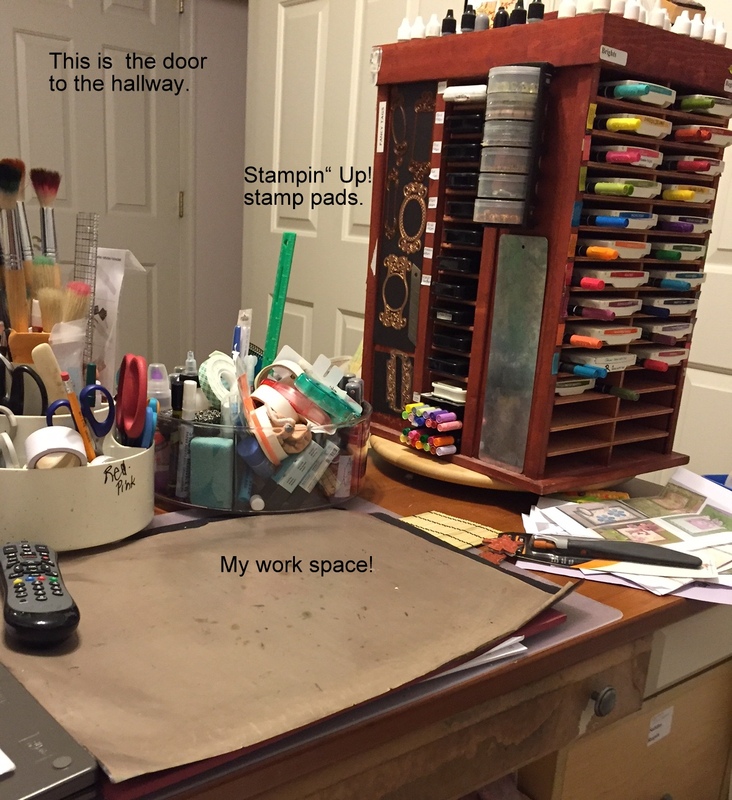 To the right of my stamp desk (and on the wall that is angled) is a book shelf for my DVD stamp cases. 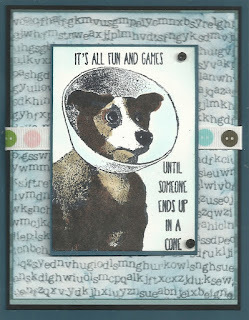 And then any stamper or scrapbooker needs card stock, correct? And then there are embossing folders -- they are in three drawers to the right of the dark blue filing cabinet. In each base cupboard there are 3 pull-out shelf drawers. Very useful in storing a lot of things. And the cupboards hold all sorts of things! I hope seeing the various areas of my stamp room has helped to inspire you with some different ways to store your craft items. If you have any questions about my storage areas, please ask. I will try to answer in a timely manner. 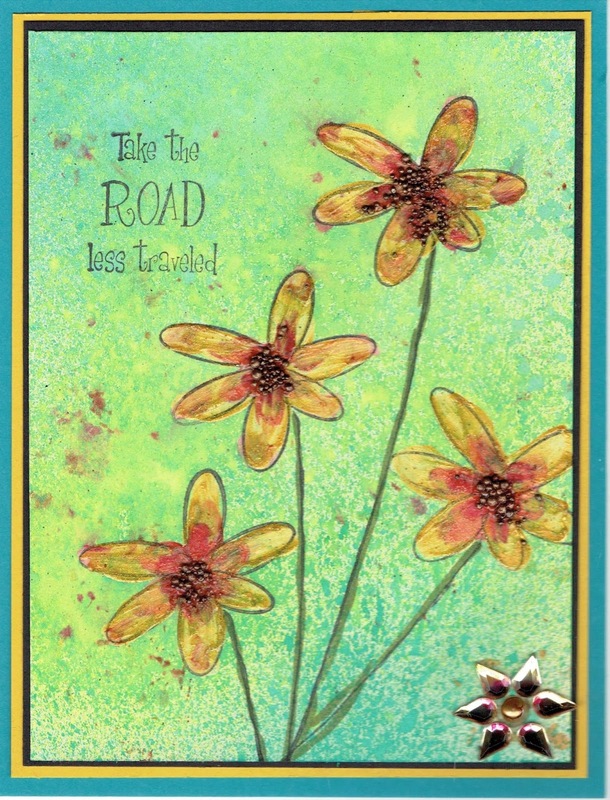 Have a great stamping (and organizing) day! This notice is not really from me -- but I am sharing it. It comes from Pat Huntoon the owner of Technique Junkie things. It has come to my attention that there were issues with the link for discounts on the Technique Junkies CDs, preventing many people from ordering them at a 20% discount. To fix that (and apologize) I have created a new code for ordering CDs with for a 25% discount! Simply use the word techniques at checkout to receive your discount. I also added all of the Annual CDs to the website, so those are now included in the discount. 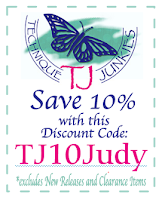 Please note that this discount applies to CDs ONLY, not on rubber stamps or other products. I apologize for the initial discount issue and hope you will still consider ordering a few with the awesome new discount! I love learning new techniques. 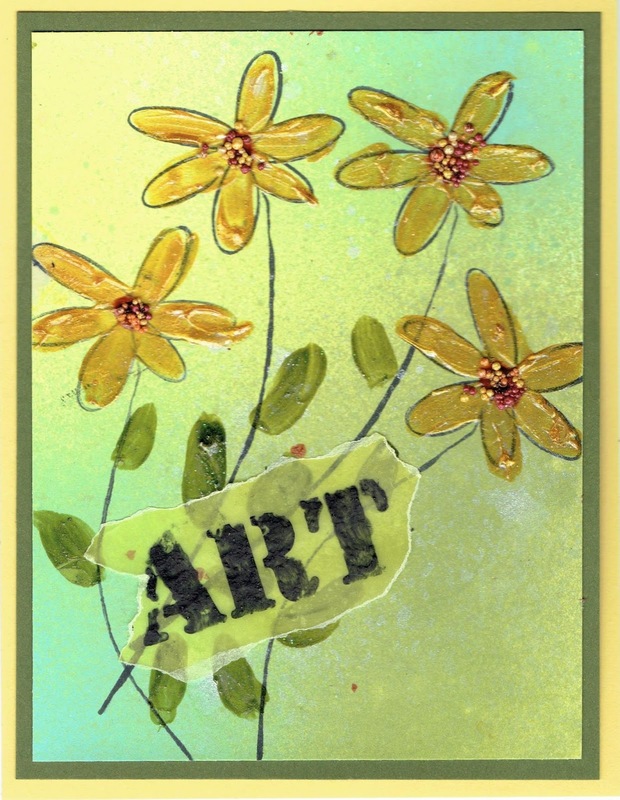 I love learning about new products for stamp art. When you combine the two -- it is very nice! 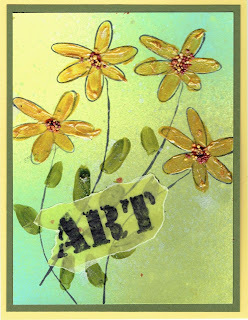 Since Pat Huntoon (owner of Technique Junkie stamps and all of the newsletters and CDs for Technique Junkie) has been showing the Art Anthology products she discovered a few years back. However, since I had to downsize my stamp room, new stuff and new tools must be truly usable for me to buy them. I am both a visual and an auditory learner -- but I learn techniques best if I can somehow visualize it. So I read her blog, I read the Art Anthology website, and I pondered. 11. If you need to stamp on top of the Art Anthology paints -- you will need to use Stazon you will need to use Stazon or Ranger Archival inks. Otherwise, the ink will not dry. 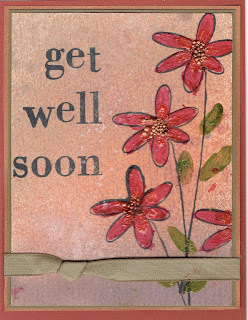 It would similar to stamping on glossy card stock. Anyone who has been following my blog over the past few months knows I have to "downsize" my collection of stamping supplies. However, one thing I refuse to get rid is all of the "starts" or "beginnings" of cards. They used to be in a drawer and now they are in a basket. The things in this basket are in various stages of beginnings. Some things are only stamped. Some things are stamped and colored in. Some things are only backgrounds. Some things are already layered but most are not. I needed two cards for two different people for two different reasons. One is for a sister-in-law and I just needed to say thinking of you. 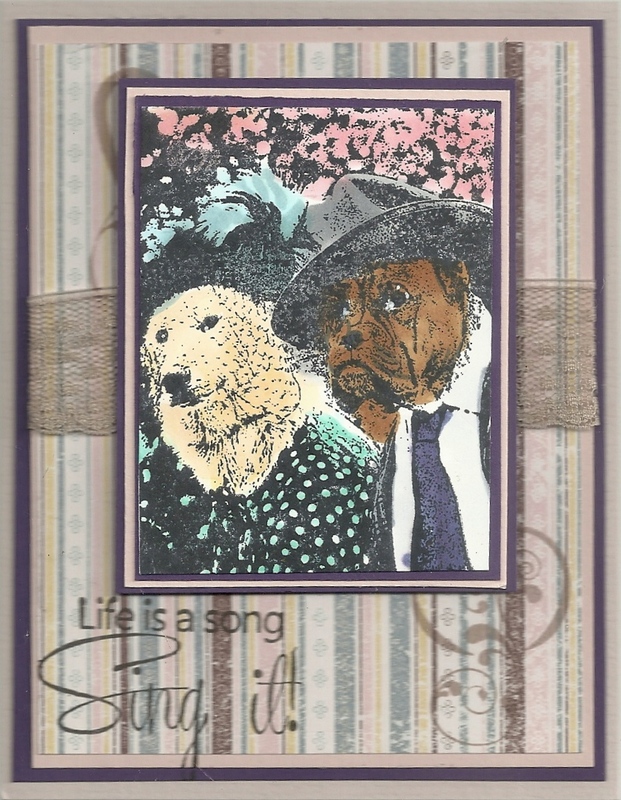 The other is for a friend and her husband as his mother recently passed away. I looked in the car starts basket for some inspiration. This one is for my sister-in-law. The verse is form Repeat Impressions. 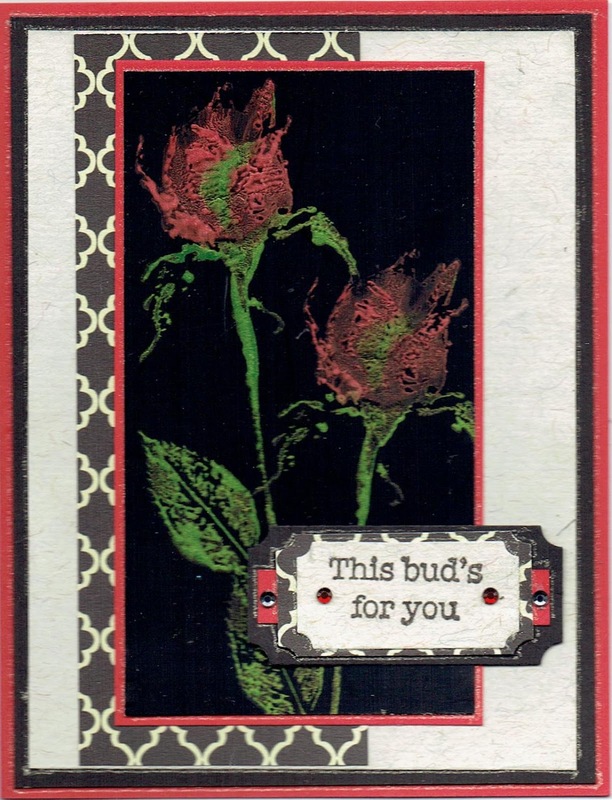 The rose stamp is from Inkadinkado. I used the technique called Smooch Direct from the October 2009 issue of the Technique Junkie newsletter. 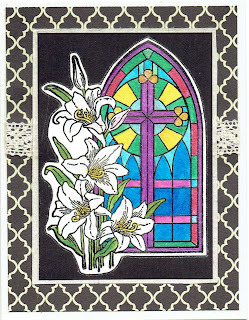 The focal image of the stained glass window is what t found in the card starts basket. I do not remember who makes the stained glass window stamp. It was already all painted in with the Twinkling H2Os. 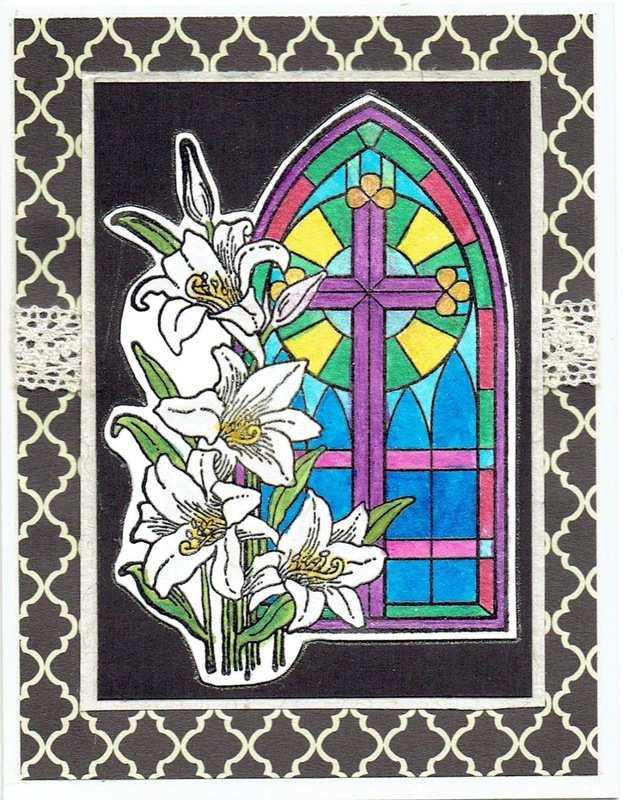 I realize it's original intention as a stamp would usually be considered for Easter. 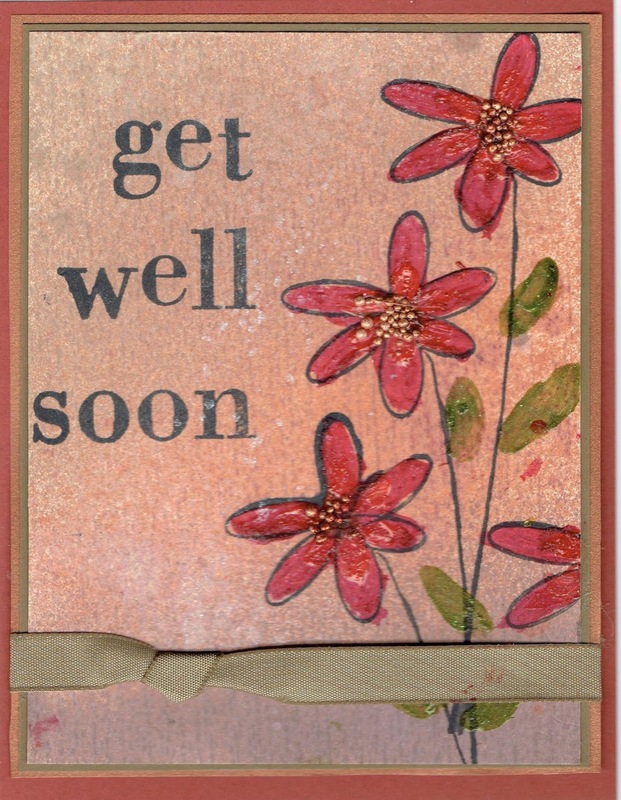 But I think it works for a sympathy card as well. 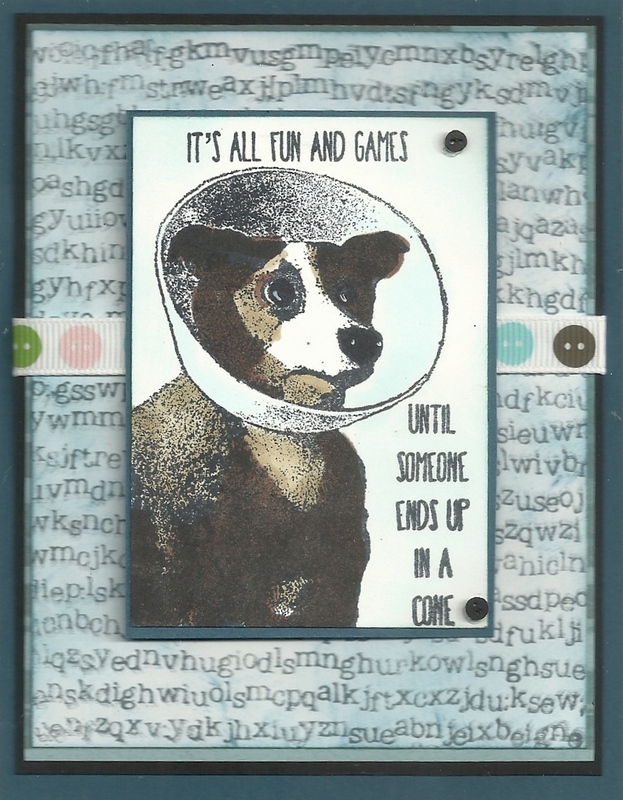 When you need to BE creative and make a card for some one, having a basket or a drawer of "card starts would be a very good way to begin your thinking. I colored her with Copic markers and layered her lovely face on several layers of different blue card stock and designer paper. 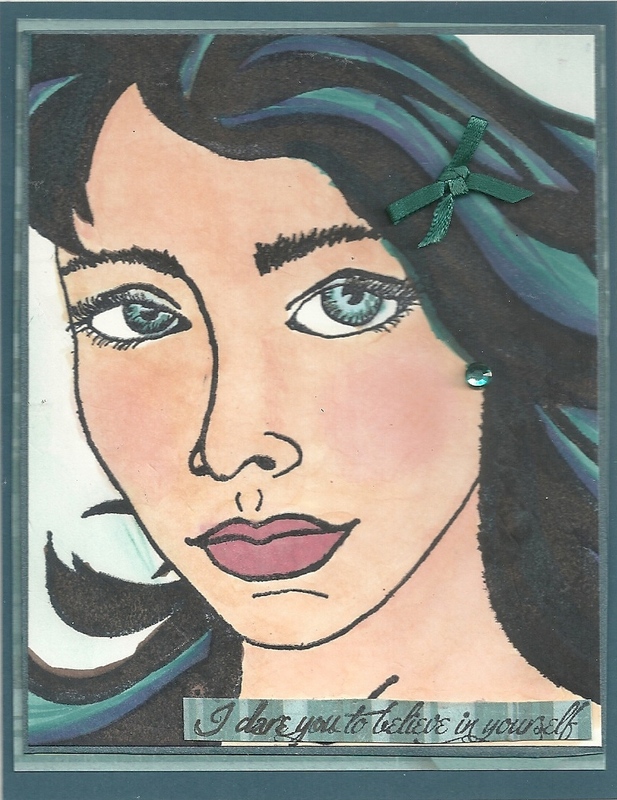 I added a clear rhinestone colored over with a teal blue Copic marker to match the other shades of blue in her hair and the various layers. the sky is sponged with a pale blue. Have a wonderful stampy day! I have a friend who feels it his task on his Facebook Life to keep us all informed as to how many days it is until Christmas. 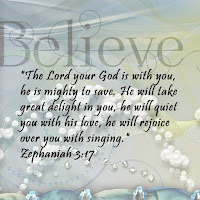 He starts giving us this information very early in the year -- about March! There is even a website to help a person know exactly how many days and hours it is until Christmas. So as of today, September 1, 2015, it is only 116 days left until Christmas! I subscribe to another blog where the Design Team designs 52 Christmas a year -- one each week. So clearly Christmas is on nearly everyone's mind for at least some of the year. If you are like me (and I do not know of very many folks who have been Christmas shopping already - but I have!) and shop for Christmas presents all year long. The adult children and spouses are easy to shop for -- the grandchildren are not always so easy. 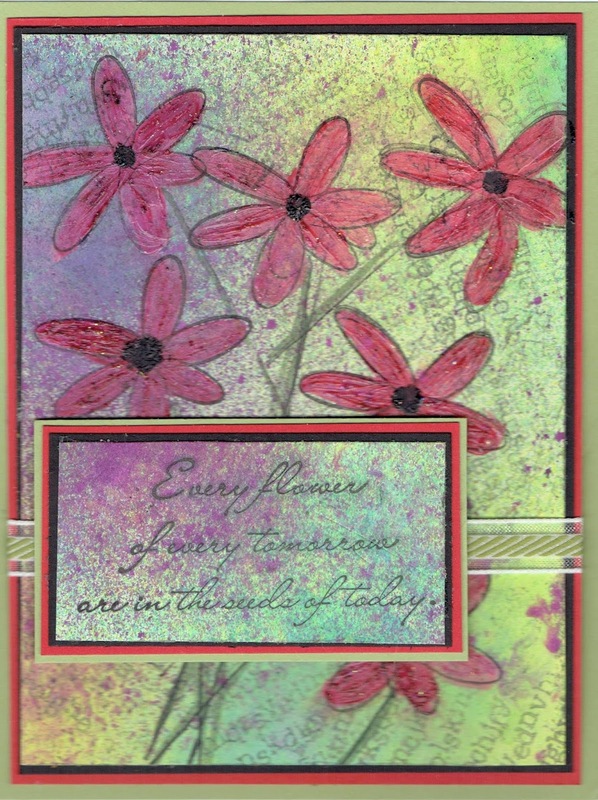 And stampers must begin the process of getting cards ready long before the Christmas shopping season usually begins. Very often rubber stamp introduce new Christmas and fall stamps in September. Why? It takes time to decide on what card or cards to make. It takes time to decide on the stamps to use. And it takes time to actually make the cards. 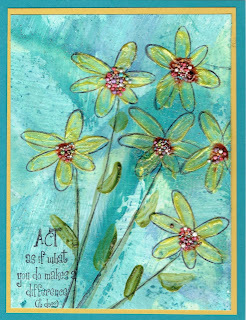 And depending on how many cards you actually make, it may take a lot of time! 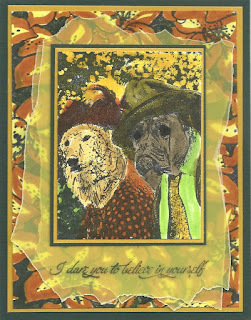 Therefore, Pat Huntoon has introduced a bunch of new stamps for Christmas and Halloween. 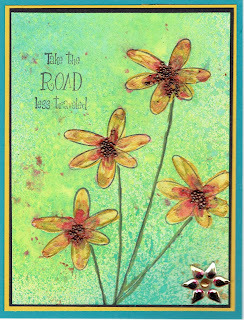 The Technique Junkie Design Team is helping to launch these new stamps. You should have come here from Jerri Jones http://www.abushelandahug.blogspot.com. I am certainher projext will be wonderful. . Enjoy hopping along! 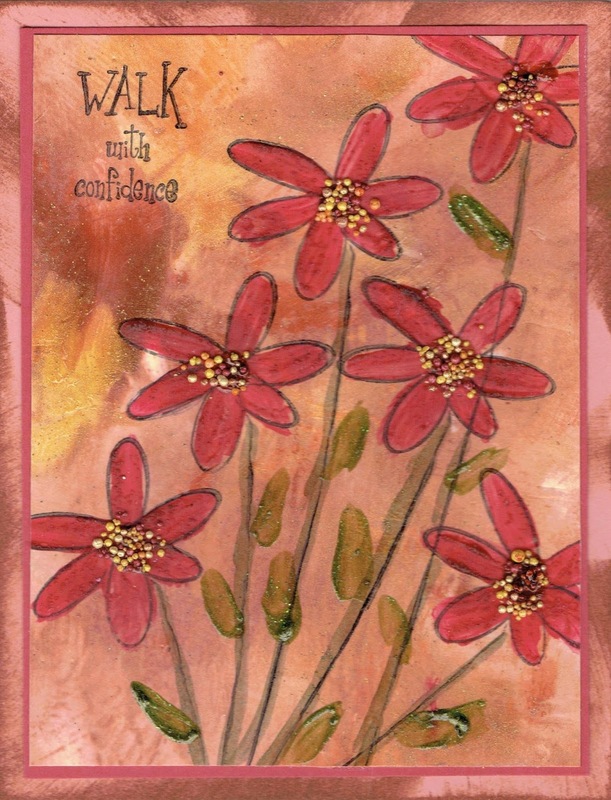 I have four cards for you today -- I hope you enjoy them. 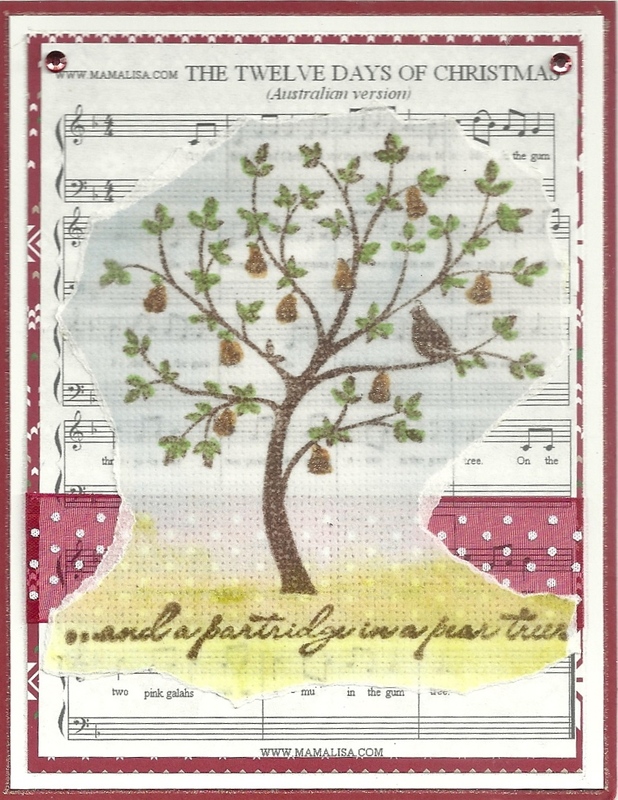 The card above uses Draped Christmas -- isn't it elegant? 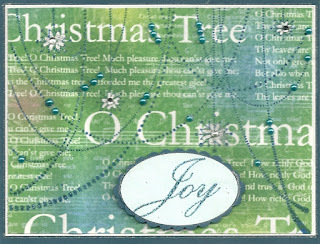 http://techniquejunkies.com/draped-christmas/ and the lovely Joy stamp http://techniquejunkies.com/joy/ . I heat embossed both with silver embossing powder on dark blue card stock. 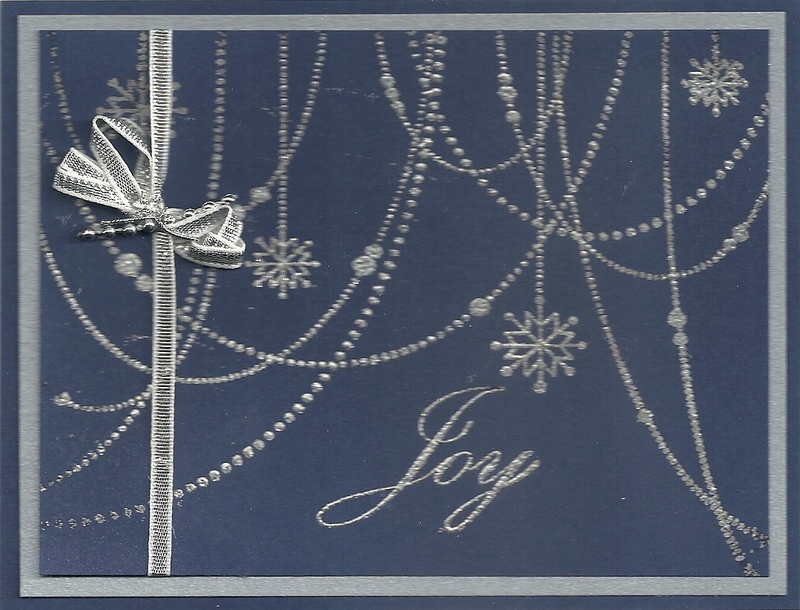 A silver ribbon and layered on silver card stock finishes it off. My third card uses the Partridge in a Pear Tree stamp http://techniquejunkies.com/partridge-in-a-pear-tree/ . For my song paper I did a "Google" search for a png version of the song. 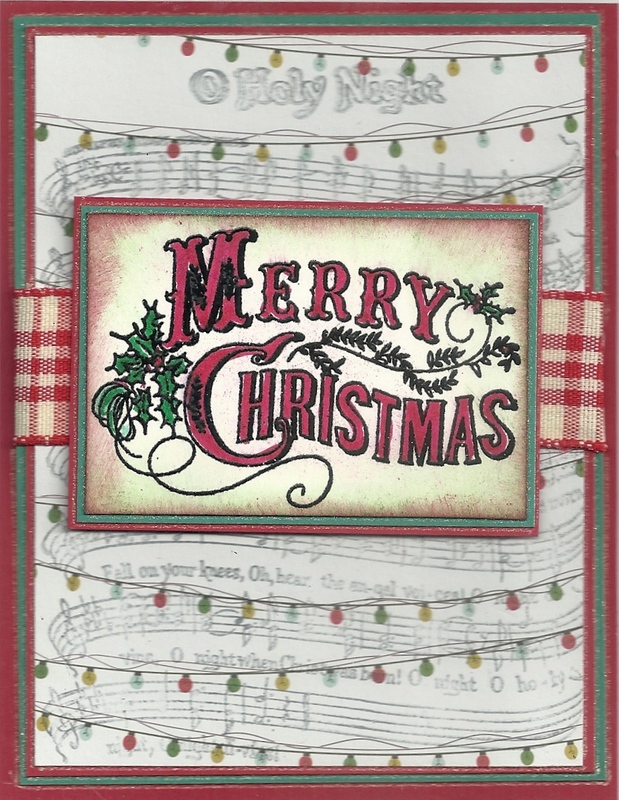 When I found what I was looking for I printed it , layered it, stamped the image with a Memento ink on card stock vellum..
My last card for you today features a very traditional font for Merry Christmas http://techniquejunkies.com/merry-christmas/. It was heat embossed with black powder and colored in with markers. 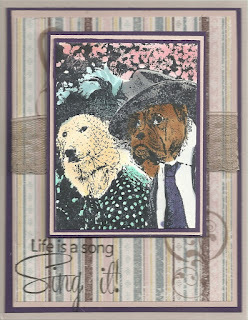 I used a piece of back ground paper with little Christmas lights and stamped the song image on top. The song is O Holy Night http://techniquejunkies.com/o-holy-night/. It is all layered as you can see. 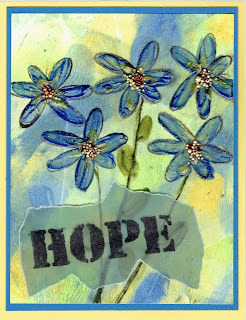 I hope you have had some wonderful inspiration from this blog hop. 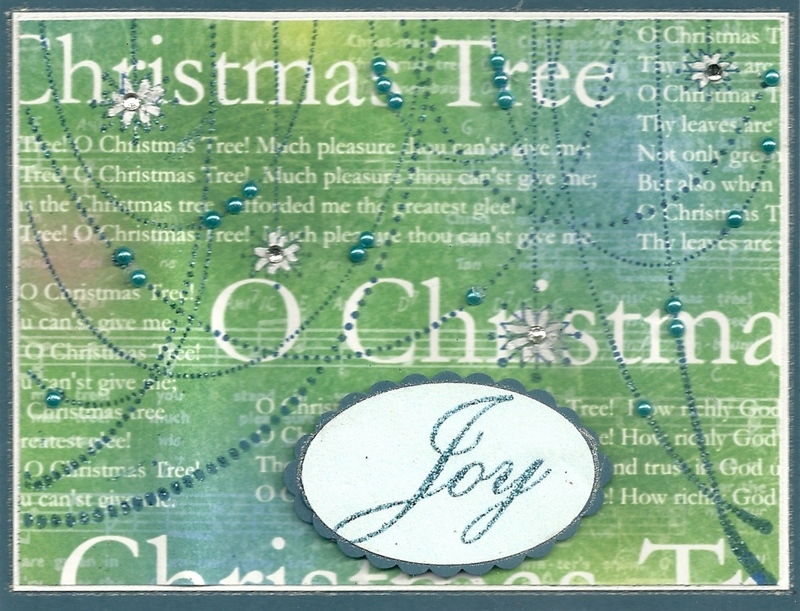 I am curious -- how many hand stamped Christmas cards do you create and mail each year? I have blog candy here for this hop. If some one makes and mails more than I do each year, I will draw the name of one person who creates more cards than I do (I am not telling you now!) and mails them! 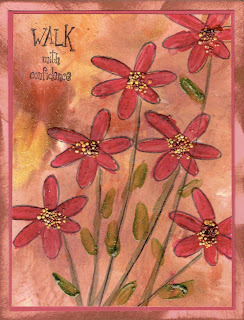 I will mail that person one Christmas card made from one of the new Technique Junkie Christmas stamps. It may not be one of these four cards. Please include your email address in this format (for protection) stampingsally at your server dot com. Sending your email address this way helps to prevent the "harvesting of email address" from various blogs. After you have finished hopping your next stop should be here: http://techniquejunkies.com/september-2015-releases/. Please remember that all September Releases (only) will be discounted with a 15% off through September 8th. The discount will show up in your shopping cart at checkout. 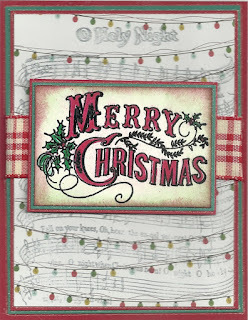 Have a great inky day -- and remember how many hand stamped Christmas cards do you make each year? Reply in the comments, please.